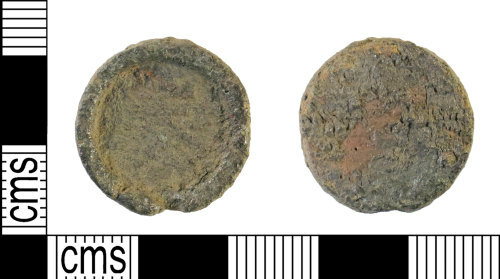 An incomplete copper alloy cup weight of Post-Medieval to Modern date (AD 1550-1900). The object is circular in plan and plano-concave in section due to its flaring sides which create a rim. There are no clearly visible marks on the upper surface of the weight. These types of weights were used for weighing gold and silver in the form of coin, small objects or as scrap metal or other precious materials (Saunders 2001, 125). Diameter: 19.28mm, Thickness: 4.79mm, Weight: 5.9g.